The beginning of the new year is a great time to tweak your marketing strategy, and to arm yourself with new tools. Choosing the right tools for your social listening efforts can help boost your brand awareness, improve your influencer marketing process, and facilitate effective competitor analysis. The right apps will give you immediate access to what people are saying about your brand or industry across social media and the web. 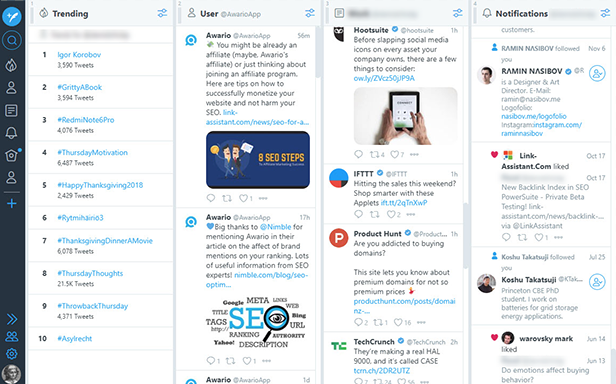 In this post, we'll take a look at some of the best social media monitoring tools on offer, in order to help you find the right one for your needs. Let’s get started. 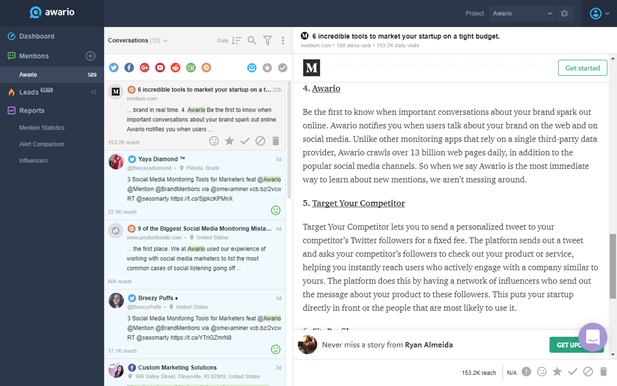 Awario will highlight mentions of your brand, competitors, and industry keywords. Although the tool is rather new, it’s already equipped with lots of enterprise-level analytics, such as sentiment analysis, share of voice, mention maps, top influencers, etc. The tool is great for online reputation management: it creates a space where you can interact with mentions coming from multiple platforms. The Boolean search mode will also help you create flexible and complex queries to get the most relevant results. Pricing: You have 14 days to try the app for free. The Starter plan is $29/month, Pro is $89/month, Enterprise is $299/month. Purchasing a yearly plan will save you 15%. 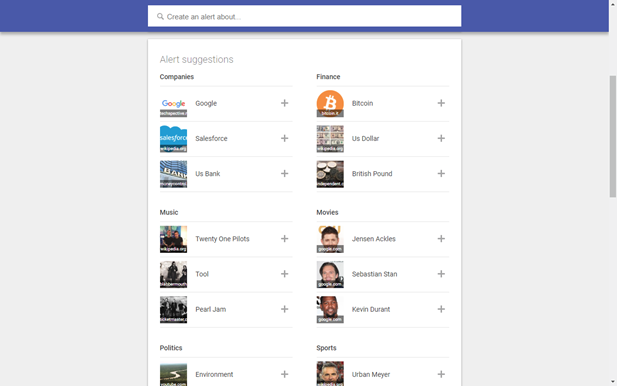 Google Alerts is focused on web monitoring, but you can also use it to track relevant discussions, news, or videos. Instead of taking care of alerts in real time, you can make Alerts send you weekly or monthly email notifications. These come in handy if you don’t receive a great number of mentions and don’t actually need to engage with them. Pricing: The app is absolutely free. Available platforms: Web, news, blogs, videos, and discussions. 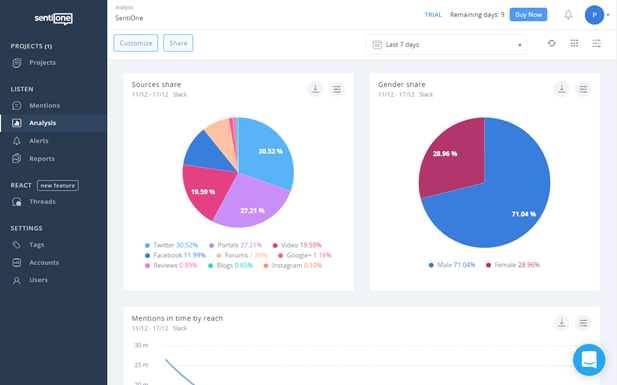 Mention is another social media and web monitoring tool - Mention’s distinctive features include a handy influencer dashboard and API access. 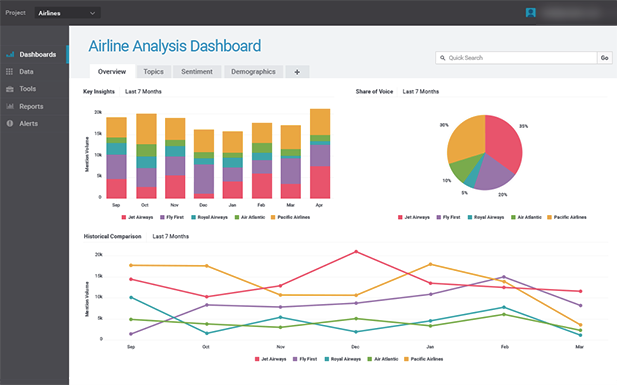 The platform offers its own reports, and with the 'Insights Center' module they become customizable and automatable. Historical data is available for users with the Custom plan only. Pricing: Mention offers a freemium version of the platform. Subscription plans start with Solo, which is $29/mo. Starter is $99/mo, and the price for the Custom plan will be calculated after you contact Mention. Purchasing a yearly plan saves 15%. Available platforms: Facebook, Twitter, Instagram, YouTube, Google+, Reddit, news and blogs, the web. Brandwatch is a top-tier tool which offers three separate products: 'Analytics' for online conversation analysis, 'Vizia' for data visualization, and 'Audiences' for better understanding your audience. 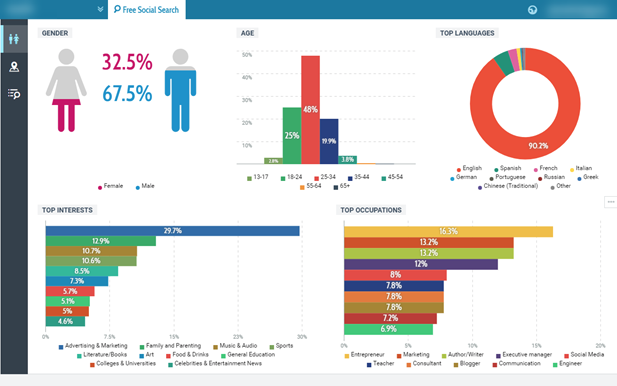 Brandwatch’s demographic data includes gender, interests, occupation, and location of your target audience. The tool is pretty customizable, as it has access to an API and various integrations (including Salesforce, Google Analytics, etc.). Pricing: All pricing is available upon request. Available platforms: Facebook, Twitter, Instagram, YouTube, Google+, Pinterest, Sina Weibo, VK, QQ, news and blogs, the web. Talkwalker is another solution for agencies, which is particularly great for reputation management. If your primary goal is analytics, then you’ll like their social listening product. The most interesting features are real-time text and image analysis along with automated reports. Pricing: There’s a freemium version of the listening solution, but the results can date back to 7 days max. The Basic plan is $9,600 billed yearly. Corporate and Enterprise prices are available on request. Available platforms: Flickr, Foursquare, SoundCloud, Twitch, Pinterest, and others. 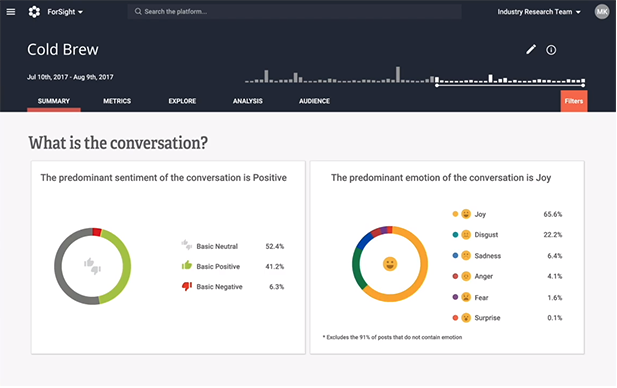 SentiOne comes with unlimited keywords and results, both historical and real-time data, sentiment analysis, and a user-friendly interface. With SentiOne, you’ll get the ability to show off your success with gorgeous, dynamic reports designed to make social media analytics data easily digestible and ready to present. Pricing: The Personal plan is $59/month, Team is $249/month, and the Enterprise pricing is available upon request. A yearly plan will save you 20%. You can sign up for a free trial before you settle on a plan. Available platforms: Facebook, Instagram, Twitter, LinkedIn, VK, and others. With Keyhole you’ll get all the necessary analytics on your mentions such as sentiment analysis, keyword clouds, and mention maps that display which countries your social mentions come from. The app is primarily focused on collecting data from Twitter and Instagram. 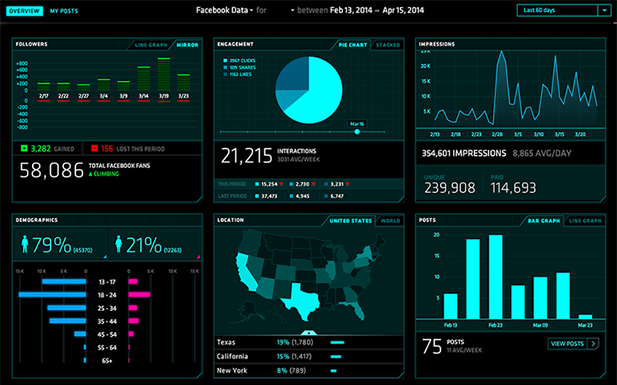 However, the Enterprise plan offers additional Facebook and YouTube analytics. Pricing: There are five service tiers: Professional is $199/mo, Team is $349/mo, Corporate is $599/mo, and Agency is $999/mo. Pricing for the Enterprise plan is available on demand. Available platforms: Twitter, Instagram, YouTube, Facebook, news, and blogs. With Agorapulse you can interact with people mentioning your brand right from the app. Agorapulse lets you invite team members and assign mentions to them, which is great for big projects or large companies. Along with social media monitoring, Agorapulse is great for social media scheduling. Pricing: The platform offers 4 plans: Small at $49/month, Medium at $99/month, Large at $199/month, and Enterprise at $299/month. Annual plans will save you up to 35%. Sprout Social is equipped with a unified inbox for a company’s social profiles. You can use the tool to generate customizable reports, assign tasks to your team members, and schedule post publishing. In the app’s listening module all data is presented in the form of statistics - you can see the performance of your topic in terms of engagement, impressions, and sentiment and check out the demographics for your keywords. 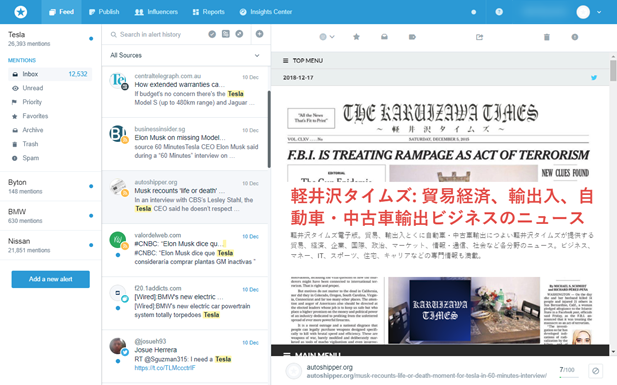 TweetDeck enables you to manage your Twitter presence, as well as monitor multiple Twitter accounts and trends. You can create columns for keywords you want to monitor. TweetDeck has the ability to narrow searches down using language, location, engagement, and date filters. You can also add negative keywords and specify authors you want to track. Pricing: The app is 100% free. 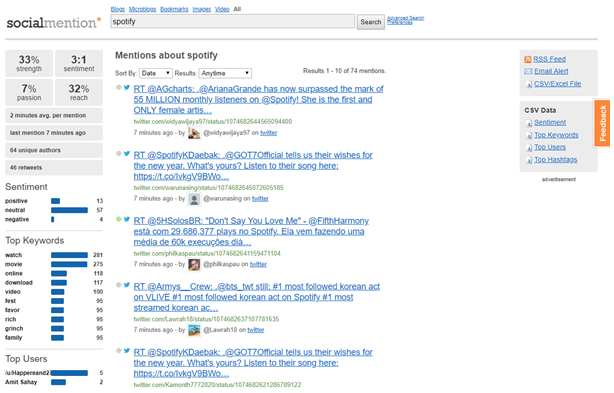 Social Mention is a free social media search engine. The advanced search option enables you to filter the results by date, language, sources, and location. However, reporting and tracking multiple keywords is obstructed by the fact that it’s impossible to create an account and store historical data. Pricing: The platform is free. Available platforms: Social Mention monitors 100+ social media properties directly including Twitter, Facebook, YouTube, Reddit, Google+, etc. Hootsuite is a social media management platform - it operates as a set of social media streams that track your keywords. When you see an opportunity to reach out to potential customers or influencers, you can respond directly from within the dashboard, or assign the response to someone else on your team. 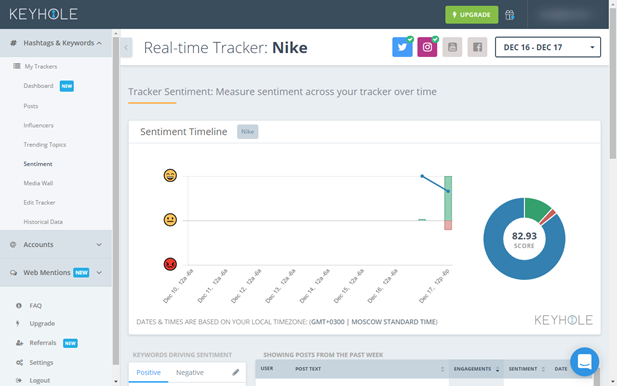 With Hootsuite, you can also track sentiment by location, language, and gender. Pricing: Hootsuite offers a free version and four subscription-based plans. The Professional plan is $29/month, Team is $129/month, Business is $599/month, and the price for Enterprise is calculated based on your needs. 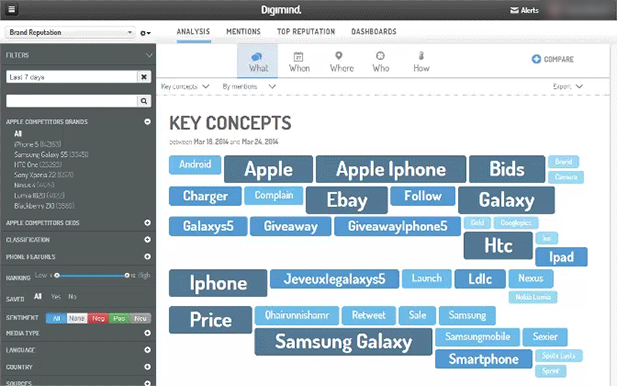 Digimind Social helps marketers understand audiences, analyze sentiment, and monitor market trends. The monitoring package includes location and country filters, sentiment analysis, and personalized tags. Using Digimind, you'll be able to prepare custom versions of reports and have a clear picture of your online reputation. Pricing: Prices are available upon request. Available platforms: Twitter, Facebook, blogs, and the web. The core feature of BuzzSumo is identifying the most popular content across social media platforms and the web, but it also provides an excellent way to analyze and monitor your Facebook Pages. 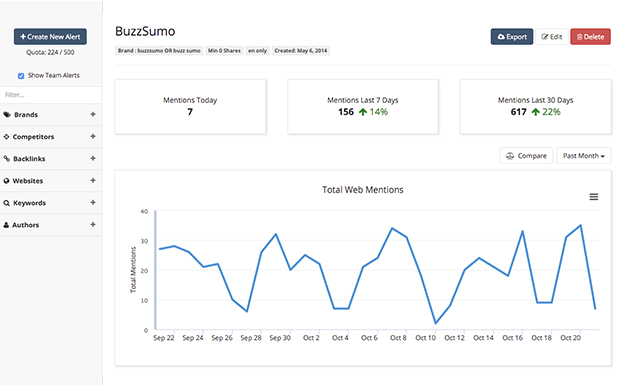 Along with metrics around each individual post, more interesting is the ability to see what content performs best - BuzzSumo will tell you what day is the best to post, how long your posts should be, what type of content works best, and stats over time. Pricing: BuzzSumo offers a free account. For those who want to upgrade there are four options: Pro at $99/month, Plus at $179/month, Large at $299/month, and Enterprise at $499/month. Buying a yearly plan saves you 20%. Available platforms: Facebook, Twitter, Pinterest, and Reddit. 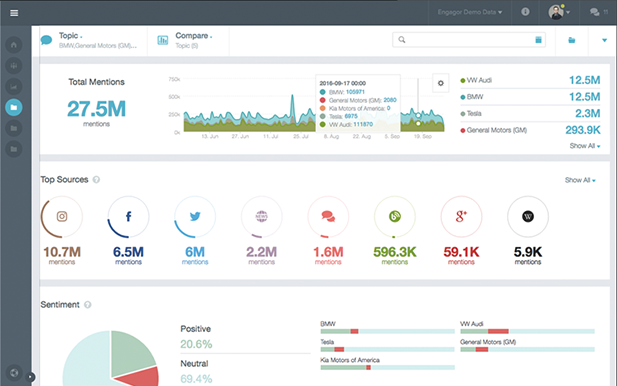 Crimson Hexagon is a high-end social monitoring platform with a strong focus on sentiment analysis. The platform offers one of the biggest social data libraries to work with - you can also use it for image and sentiment analysis and prepare optimized content for deeper engagement with your audiences. Crimson Hexagon indexes and saves useful data in their own library which is accessible to clients on demand. Pricing: Crimson Hexagon has a customized pricing scheme, which depends on the amount of data users will have access to. Available platforms: Facebook, Twitter, Instagram, YouTube, Weibo, Blogs, Forums, News, Comments, Reviews, and the web. Oktopost is a B2B social media management platform - it was essentially designed as a unified inbox for all your social media accounts. 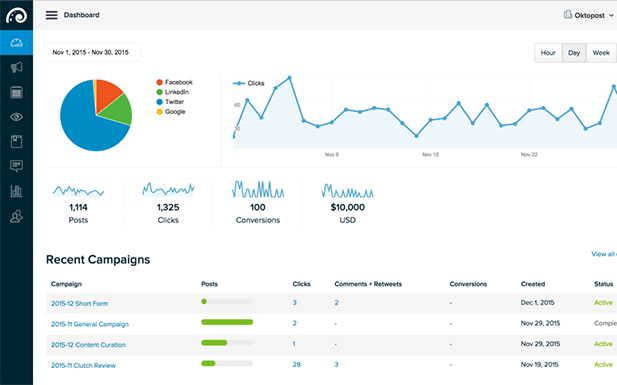 The platform is equipped with features for team collaboration, social publishing, and analytics. If you've purchased the advanced Talkwalker social media monitoring suite, you can integrate it into Oktopost and boost your social listening. Pricing: Pricing of the tool is determined by the number of user seats, social profiles, and organization structure. You can learn more during a demo with their team. Available platforms: LinkedIn, Facebook, Twitter, and Google+. From a social listening standpoint, developers of CX Social promise to deliver data from all the major social media platforms as well as from review sites, forums, blogs, and news sites. CX Social will help you nurture your customer service by giving you the ability to communicate with your clients across multiple social platforms. Clarabridge also integrates data from social CRM tools. Pricing: The app offers two weeks of free trial. The prices for subscription plans start at $500. Available platforms: Facebook, Twitter, TripAdvisor, and Booking.com, among many others. NUVI enables you to collect and classify the keywords and influencers that matter most to your business. The app displays the data in insightful visualizations to help you make decisions quickly and effectively. 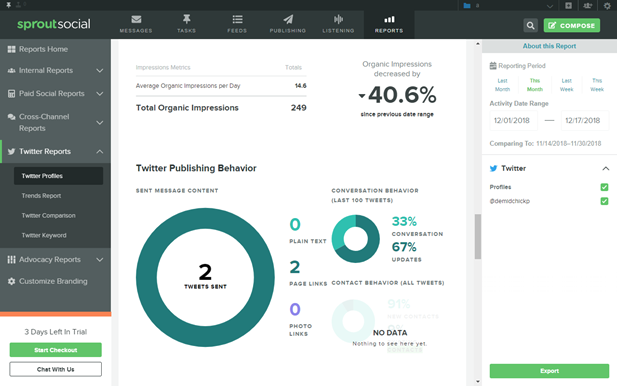 NUVI will also help you schedule and publish your posts, analyze your activities, and generate reports. Available platforms: Twitter, Facebook, Instagram, YouTube, Reddit, VK, and blogs. 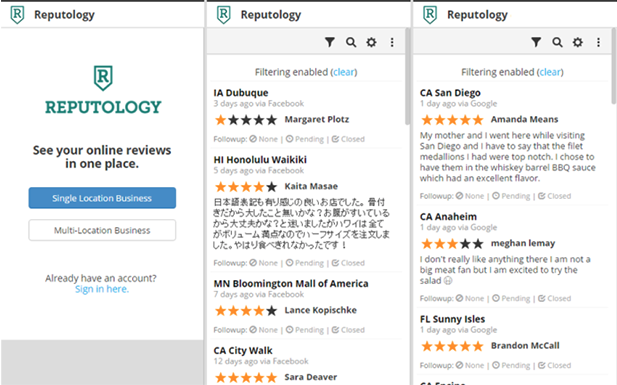 Reputology lets businesses monitor and check major review sites, including Google, Facebook, and Yelp reviews. You get the ability to respond to reviews from the app. 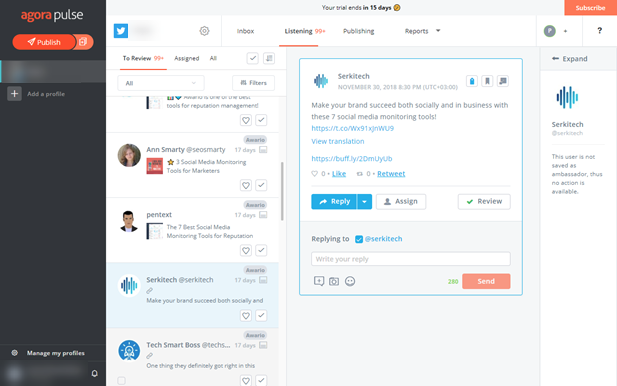 The Hootsuite integration also enables you to monitor and manage your reviews in the same dashboard where you keep your social media accounts. Pricing: Reputology charges from $10 to $49/month for every location. You can sign up for a free trial before you settle on a plan. Available platforms: Google Reviews, Facebook Reviews. 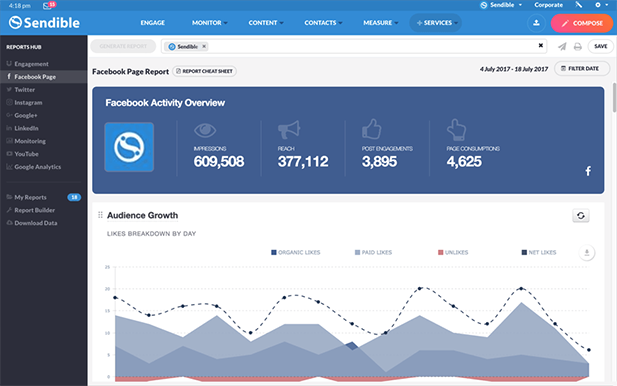 Sendible is a full social media management suite. 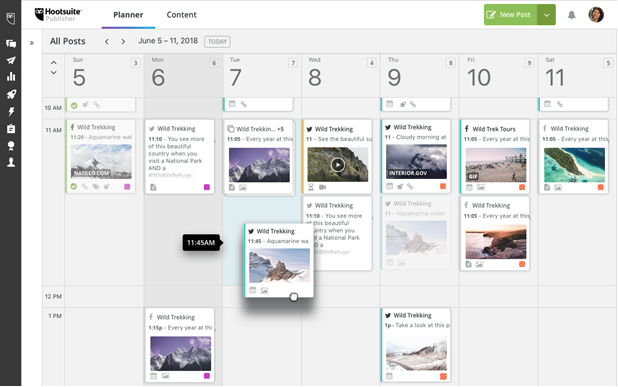 On top of scheduling and collaborating on social media content, you get the unified social inbox with the opportunity to engage with mentions on social media and the web. Sendible will constantly analyze your social media profiles to suggest the best content that resonates with your audience. Pricing: Sendible offers you 4 subscription options to choose from. Micro is $29/month, Small is $99/month, Medium is $199/month, and Large is $299/month. Each plan is preceded by a 30-day free trial. Don’t forget that the apps listed in this post are able to bring value in multiple scenarios - from social listening to social management to lead generation. Choose a tool tailored specifically to your company’s needs - whether you need to improve customer success, increase brand awareness, find leads, or all of the above. And to make the right choice, set clear goals for your campaigns, compare multiple solutions, and go for the one that fits your needs best. Remember that the most important part of social media monitoring is actual engagement with those mentions, thus bringing value to your customers.